The starters for Pokémon Sword And Shield are Grookey, Scorbunny and Sobble. They’re all cute. Which one will you pick? Japanese website Inside Games asked its readers just that. Here is how the results breakdown via Livedoor News. What about you? Which starter will you pick? Sobble won that? Thing looks like its going to break down and cry at any moment, lol. I think he got the sympathy vote. Grookey for the win ! Sobble for sure. I've almost always chosen the grass Pokemon as my starter in each generation but they really emphasised Sobble's personality. S/he feels more unique and interesting than the others, as a result. 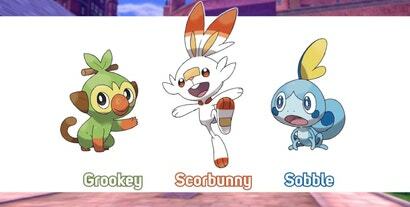 Scorbunny looks the most generic and least interesting of the three, IMO. The design looks more like a half-baked Looney Tunes character than a Pokemon.